By rejecting a petition by Palestinian residents of Area C, Israel’s High Court of Justice effectively cemented two separate planning regimes on the same plot of land: one for Jews, another for Palestinians. Israel’s High Court of Justice on Tuesday rejected a petition to grant planning authority to Palestinians in Area C of the West Bank so they can build on their own land. In doing so, Justices Elyakim Rubinstein, Noam Solberg and Neil Hendel solidified the current status quo, in which two separate planning systems exist in the West Bank: one for Jews and another for Palestinians. While Jewish settlers in the West Bank are represented in local planning committees like every citizen of Israel, the local Palestinian councils were nullified and replaced by military officials who make planning decisions in their stead. Even the regional committees — the highest bodies that oversee planning in Area C — belong to the Israeli army — and while they include settlers, they include no Palestinian representation. This is part and parcel of the legal reality in the West Bank, which places Jews and Palestinians under two different sets of laws. That system results in a situation in which: less than 1 percent of Area C is zoned for Palestinian use; 94 percent of requests by Palestinians for building permits are rejected; approximately 70 percent of Palestinians in Area C live in unrecognized villages, and thus are not connected to a water supply or have proper sewage infrastructure. This is one of the main reasons why Palestinians who live under full Israeli control suffer from higher rates of poverty and nutrition insecurity than Palestinians under partial Palestinian control in Areas B and A, not to mention hundreds of home demolitions by the Israeli army every year. These, among other reasons, led the village council of Ad-Dirat- Al-Rfai’ya, Israeli NGO Rabbis for Human Rights and others to petition the High Court in 2011, and demand the re-establishment of the Palestinian planning committees, which existed under Jordanian law until they were revoked by military order in 1971. In his majority opinion, which had unanimous support, Justice Rubinstein warned that any change in the status quo would have repercussions on larger policy issues, and thus the High Court does not have the authority to change it. Furthermore, the justices adopted a new planning procedure put together by the state while the High Court deliberated the petition, which for the first time in 50 years would force military planning committees to include the heads of Palestinian villages in everything having to do with planning in their villages. While the procedure will force the committees to update and confer with village heads, it does not resolve the issue of allowing Palestinian representation in bodies that make binding decisions. 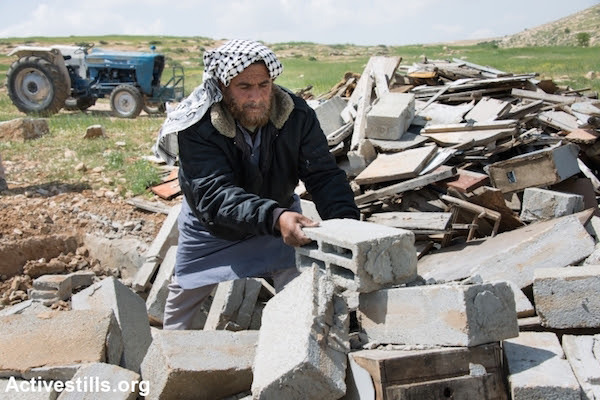 According to Rabbis for Human Rights, the inclusion of Palestinian leaders took place in the past, but it never did anything to improve the planning situation in the villages. In other words: democracy is for Switzerland, we are in a different and delicate situation (which has lasted almost 50 years. Thus it is legitimate for the army to retain control of Palestinian planning needs. Despite the aforementioned statistics, Rubinstein ruled that there is no proof of discrimination against Palestinians when it comes to planning in Area C.
According to Solberg, the state’s plan to include Palestinians in the planning process constitutes a “significant upgrade.” I wonder if Solberg, himself a settler who lives in Area C, or even Rubinstein and Hendel for that matter, would be content with such an “upgrade” if they were living under foreign military rule and did not enjoy representation in planning institutions. In its latest ruling, the High Court of Israel has legitimized a regime of separation and discrimination in planning in Area C of the West Bank. This system of planning, applied in the area under full Israeli control, infringes on the rights of the Palestinians to basic infrastructure, a roof over their heads, and development of their own private land; this despite the Palestinians being a protected population living under an ongoing military occupation of almost fifty years, whose civil life the Israeli authorities are obligated to protect. In a systematic abrogation of international law, settlers are concurrently granted preferential and additional rights in their own planning system. A regime of separation and discrimination is amongst the darkest of possible regimes and the court, in its ruling, missed this opportunity to stop the abuse of government (and military) power. This ruling has removed the hope of many Palestinian residents and villages and quite a few Israelis that despite the military occupation, the principles of justice are what guide the Israeli court system. More serious than this, the decision justifies and encourages continuing the policy of planning strangulation and home demolitions that will now continue with greater “legitimacy” in the light of the decision – effecting not only this generation but also the coming generations of Palestinians living under Israeli military rule. In this way, the court further validates the belief that the aim of the Israeli military occupation is to reduce, if not to completely negate, Palestinian living space as much as possible. Like this posting help us in our time of need!